In 2017, 21st Century Fox partnered with the U.S Department of State to launch #HiddenNoMore, an all-female STEM (science, technology, engineering, and mathematics) leadership development program inspired by the Fox 2000 film Hidden Figures. The initiative marked the first time in history that a Hollywood movie led to the creation of a publicly-funded educational exchange program. 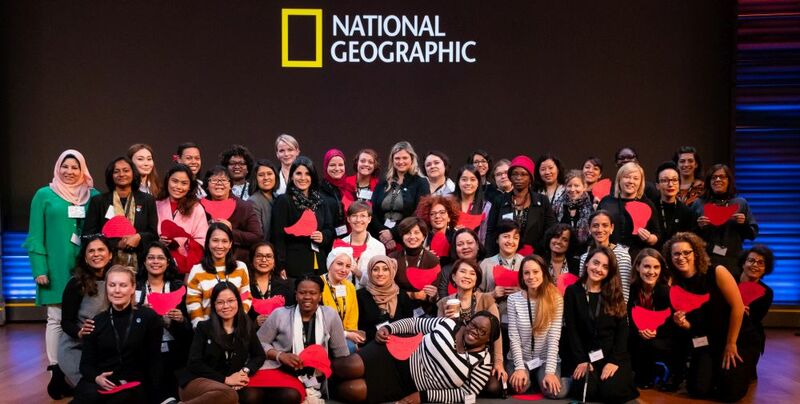 In 2018, 21CF and the State Department brought a second diverse group of women leaders from 49 countries to the United States for the 3-week exchange program. #HiddenNoMore has become a flagship initiative of the State Department’s International Visitor Leadership Program (IVLP), which has recently focused on the advancement of women leaders in STEAM (science, technology, engineering, the arts, and mathematics) fields. The most recent cohort kicked off this past Halloween at National Geographic headquarters in Washington, DC. National Geographic executives Marcela Martin and Marcus East welcomed the group with a candid reflection on their own journeys in STEAM careers. Kavita Gupta, National Geographic Explorer and Grosvenor Teacher Fellow, also shared her inpsiring “STEM Cinderella Story” – a small town girl from India who went on to taking the international stage. IVLP participants also had the chance to hear from Kate Coughlin, Senior Director, Audience Development at National Geographic about the importance of using social media to help build one’s brand, and from Sandra Elvin, PhD., Program Officer, Wildlife on the different grants National Geographic Society offers and how participants can apply for one following the program. Highlights of the day also included a screening of the film Hidden Figures, a virtual reality exhibit of National Geographic’s Tomb of Christ: The Church of the Holy Sepulchre Experience and Titanic: The Untold Story, and a networking lunch with National Geographic employees hosted by 21CF employee resource group, Women in Technology (WiT). Following their time in Washington D.C, IVLP participants traveled across the United States in smaller groups to Charleston SC, Greensboro NC, Boston MA, Chicago IL, Huntsville AL, Little Rock AR, and Orlando and Pensacola FL to network with professionals and thought leaders in scientific conservatories, associations, universities, businesses, and agencies. This professional exchange allowed participants to gain insight into the critical need for women’s involvement in the design, engineering, and implementation of scientific research, applications and solutions in STEAM. The program culminated in Los Angeles, where 21st Century Fox hosted a full day of events on the Fox Studio Lot, tying all the pieces together from STEAM applications in the entertainment industry to the importance of storytelling and representation of women on-and-off camera. The day included introductory remarks by Melody Hildebrant, Chief Information Security Officer at 21st Century Fox, tours of the lot and studio archives, a behind-the-scenes look at virtual reality projects from Fox Innovation Lab, FoxNext and National Geographic’s new ‘space projection helmet’ inspired by the series One Strange Rock, a networking luncheon and lot wide panel discussion hosted by WiT, and a presentation of the latest ‘STEM in Media’ study by Dr. Caroline Heldman, Director of Research and Elizabeth Kilpatrick, Vice President of Development & Operations at The Geena Davis Institute on Gender in Media. The closing reception brought together 21CF leadership, IVLP participants, State Department staff, outside partners, and local elected officials to commemorate the historic nature of this exchange program. Janet Elliott, President & CEO of the International Visitors Councils of Los Angeles and Teta M. Moehs, Deputy Director of the Office of International Visitors, Bureau of Educational and Cultural Affairs shared a few words on their shared commitment to the phenomenon that has inspired a movement in STEAM and its impact on current and former participants of the program. Last year’s distinguished group of young women leaders continue to make headlines as alumna, working collaboratively to close the gender gap in STEAM fields around the world. Dr. Jessica Wade, a British physicist and early career researcher at the Blackett Laboratory at Imperial College London was internationally recognized for writing over 300 Wikipedia entries on women and minorities in STEM, including National Geographic Magazine’s Editor in Chief, Susan Goldberg. Dr. Caroline Dahl, Clinical Innovation Fellow, Ph.D. at the Royal Institute of Technology in Sweden created Agenda 50/50, a compilation of 46 solutions for gender equality inspired by the UN Sustainable Development Goals. The interventions were created by women, for women, and contain everything from tips on rhetoric to claiming immaterial property – many of the tips come directly from experiences from last year’s cohort. #HiddenNoMore also played an important role for 21CF colleague network and resource group, Women in Technology (WiT). It was last year’s inaugural #HiddenNoMore that launched WiT in Los Angeles, and has continued to have a lasting impact on its membership. After kicking off only a year ago, WiT now has chapters in Washington D.C and New York, and has already received recognition for its work in advancing and celebrating women’s leadership in technology; WiT Co-Chair, Cybill Miklaszewski accepted the “Women in Tech Hollywood’s Leadership Award” earlier this year. Learn more about 21CF’s activations around the film Hidden Figures that led to the #HiddenNoMore partnership with the U.S State Department. To see more photos, follow the hashtag #HiddenNoMore on Twitter & Instagram.